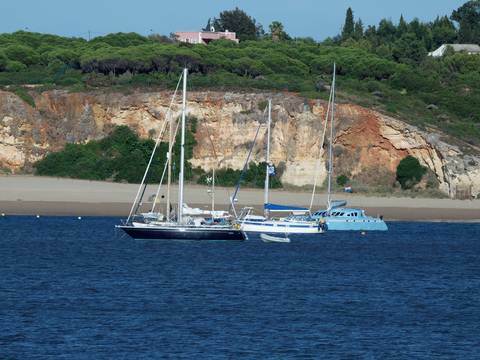 Portimao is a fairly uptown place and very popular with tourists because of its location close to lovely beaches and a superb marina.Plenty of golf courses and sailing boats bring in a lot of wealthy travellers. You will find many shops of all types and will see many names you know from home and many household name designer shops,such as Mango.Lots of nightlife with bars and restaurants in great numbers.Portimao as a coastal town will be well worth the attention of any tourist.Sitting on the banks of the Arade river the lovely town of Ferragudo sits on the opposite river bank and the famous beach resort of Praia da Rocha is close by.Portimao Marina is a "must see".Really it is just stunning with the pristine blue Atlantic Ocean framing all the high end boats.You will see large ocean going yachts and sumptuous cabin cruisers and sometimes an old style sailing ship.The buildings around the marina are bright and beautiful in ochre and terracotta.It all needs to be on your holiday agenda.Seriously! 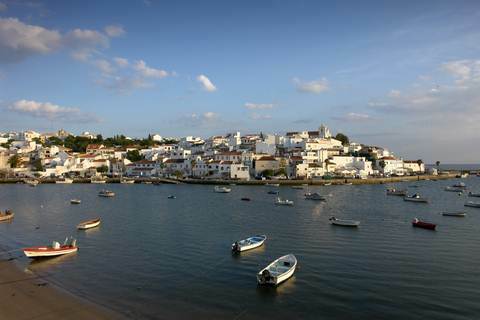 Ferragudo is a lovely village on the opposite bank of the Arade River from Portimao.In the past mostly based on fishing but tourism has made this lovley village rather exclusive,certainly from the view of buying property.You will see many large and luxurious villas on the outskirts. The older part of the village comes down the hill to the waterfront and this is a very pretty entranceway into the village as you follow the original fishing type houses down to the harbour.Ferragudo has a magnificent and rather lovely square where you can sit in one of the many cafes and bars.An old fort sits on the hillside,unfortuneately it is now a private dwelling.A famous poet bought it in the early 20th century to make his home.Ferragudo is well worth a visit or a longer stay as you have Portimao and Albufeira nearby along with a great Water park Splash and ride.There are also a number of excellent beaches close to the village and a lighthouse. Below.Looking over to Ferragudo from the opposite bank of the town of Portimao. The coastline is so spectacular and the ocean is unrecognisable as the Atlantic Ocean we know between the United Kingdom and the United States of America.That rough old lump of green water.Here so much nearer the Equator it is the most fantastic shade of blue and so often like a millpond. Spectacular Atlantic shores "Oh! To stand and stare awhile"
See how on a sunny day the water turns to bright blue.You need to experience this wonderfull timelessness.It is so easy to see the ancient Portuguese mariners sailing out to find new colonies.It must have been a lot more pleasurable to be a sailor leaving from these lovely sun kissed waters.Than being a British sailor leaving the not so sun blessed waters of Great Britain. 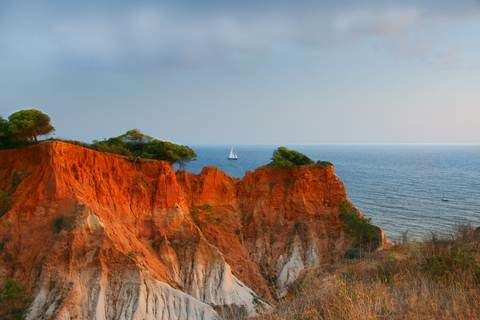 Having lived and worked "man and boy" in England;I just wish I had not been forced to stay at home untill my fiftees.I can only day dream about the possibilities,if I had encountered the stunning "coast of light" that is the Algarve; in my youth. Many of these Rocky Outcrops can be viewed and enjoyed whilst reclining on the superb Golden Sandy beaches.Beaches which line the coast for mile after mile. 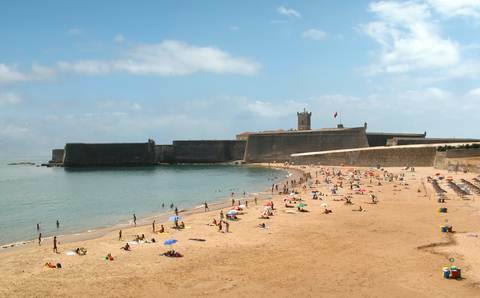 These beaches are noted as being amongst the best in the world.Mostly having the European blue flag for safety and cleanliness.You can be sure the Portuguese will always take great care of their beaches on the ALGARVE-COAST.Their living depends on these high standards being ruthlessly maintained. 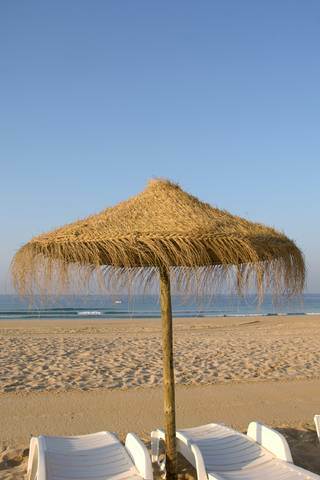 We will shortly be doing a page on Algarve Beaches so keep a look out for that. Stand on those same rocky outcrops above and stay a whlile.You will often see a school of dolphins.such as those above.They are a very common sight so remember to take some binoculars with you;to appreciate them all the better.You will be even more likely to see a site such as this if you take one of the many ALGARVE-COAST trips.What could me more pleasurable than this . 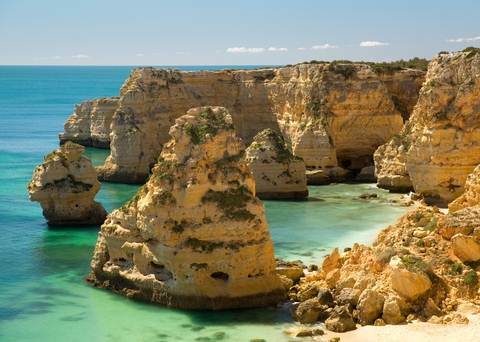 Having shown you the rocky spectacular side of the Algarve coastline,I should now show the other kind of tourist how Portugal has the most fabulous sandy beaches that can rival anywhere in the world.The summer temperatures can be up in the forties but you tend to have cooling breezes on this Atlantic coastline. Colourfull fishing villages and boats still exist on the sandy shores,although much damage has been done in the heavily touristic areas by forcing the locals out of their beachside homes.This is such a greedy and shortsighted policy by the big holiday companies.They should have left the traditional to thrive alongside their big modern plans.To see the more traditional fishing villages you need to look away from larger towns and cities.You will still find them and the wonderfull fishing boats on the beaches of the ALGARVE-COAST. Portugal takes great pride in its beaches and you will find many European Blue Flag beaches.It makes sense really as in these modern times tourism is the major industry and the Algarve people are very good at looking after he tourist. The Atlantic ocean waters are so different here in the sunny climate and the water is spectacularly clear and refreshing.There are so many beach activities to be enjoyed here;with diving,surfing and windsurfing and Paragliding all to be found by the sporty tourist.The daylong sunbather will find they are well catered for as well,with many beachside hotels placing sunloungers in neat rows on the sandy beaches and around large stunningly clean swimming pools sparkling in the glorious sunshine and beautifull blue skies.Whatever is your desire you will find it in this clean aired Portuguese region. 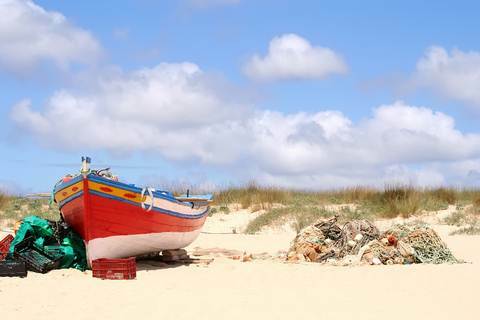 Still to be found are the fabulously coloured fishing boats on quieter beaches in the Algarve region.Showing that not all the quaint traditions of these Portuguese fishing communities have been wiped out by the greedy tourist Hotel chains.Why on earth do the poor fisher people have to be moved away from the beaches which have provided their living for centuries.So many of them have been moved off into soul less council type blocks of flats.My heart really aches for these hidden people whose wonderfull lives on their own ALGARVE-COAST have been taken away forever.Just so rich tourists do not have to mingle with them,well why else were they robbed of their fishing communities;there was and is plenty of room for both! Something I need to make you aware of is that Algarve beaches open straight onto the Atlantic ocean and therefore just as in the united kingdom you have to be responsible.There are lifeguards on virtually all major beaches and a flag system so you know when it is safe to bathe.As long as you obey the rules you will be perfectly safe.It is only the foolhardy who run into problems. Generally the beaches on the East Algarve are better for bathing in that the currents tend not to be quite so strong and the water is usually a couple of degrees warmer.The east end of the Algarve is close to the landmass of Spain and more importantly a little more sheltered being close to the mouth of the Mediterranean sea.The beaches this end are endless and even in the peak summer season you should be able to find plenty of room. This does not mean the Central Algarve beaches should be shunned;as said above they are perfectly safe as long as you obey the rules and exercise some common sense.There are some fabulous beaches around Albufeira ,Vilamoura and the Lagoa district including Lagos.There are many beaches of all types along this central ALGARVE-COAST.You will find exactly what you want. The west end tends to be a little rougher the further west you go and generally tend to be better for watersport enthusiasts and strong experienced swimmers.This does not mean you cannot find a suitable beach in the west but you need to be a lot more carefull.Just make sure of what you are doing and seek local advice about the safest beaches and safest times for swimming. 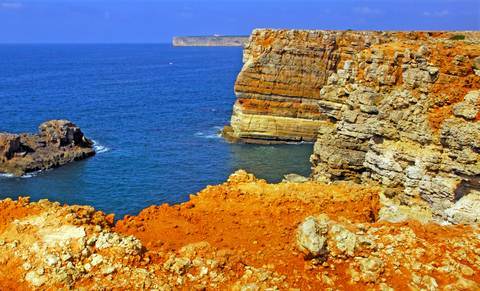 Which part of the ALGARVE-COAST is right for you and your family or group? It is not quite so important nowadays as the new n125 road runs virtually end to end of the region and you can travel from one end to the other in around 2 hours.However you do not want to spend all your time driving around because you selected to stay in the wrong area.So the east-algarve is generally a gentle coastline dominated by the huge nature reserve the Ria Formosa.This is not the end for night clubs but is i think the greenest end and is nearer to the Spanish border which opens up loads of trips into Spain.The Ria Formosa is a nature lovers paradise,best explored from a boat and you will have no trouble hiring one with or without a guide.You might find this end a little cheaper but for families there is no compromise on beaches,the east Algarve has plenty of gorgeous beaches.If you like to move around a lot this area is great as you have lots of beaches close enough to visit a new one every day. The east ALGARVE-COAST is not generally so rocky as the west end and is a little more protected via the coast of Africa.Many people are discovering this end of the Algarve after years of going to the other regions and are falling in love with it.It all depends on what you want.If you are a night owl it may not be the best for you but from the perspective of plenty to see and do and plenty of different beaches ideally suited to the Family it is unbeatable.Water sports are getting better now ,however for the real hardened types who want excitement the west ALGARVE-COAST end would be a better choice. There are so many activities for you to take part in on the coastline.We recently found out there are numerous rock climbing schools and of course surfing kitesurfing,sailing ,fishing both river and sea fishing.Even big game fishing.You can hire bikes almost anywhere to explore via pedal on your own or with groups and really explore the cliff tops!Activities are almost endless and you can find many of them on the left hand navigation bar. 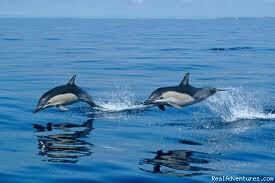 The more you read up and plan for a holiday here the more exciting and eventfull your vacation will be.